BEAUREGARD, Ala. (AP) - At least two people were killed by a possible tornado in Alabama on Sunday as severe storms destroyed mobile homes, snapped trees and left a trail of destruction amid weather warnings extending into Georgia, Florida and South Carolina, authorities said. 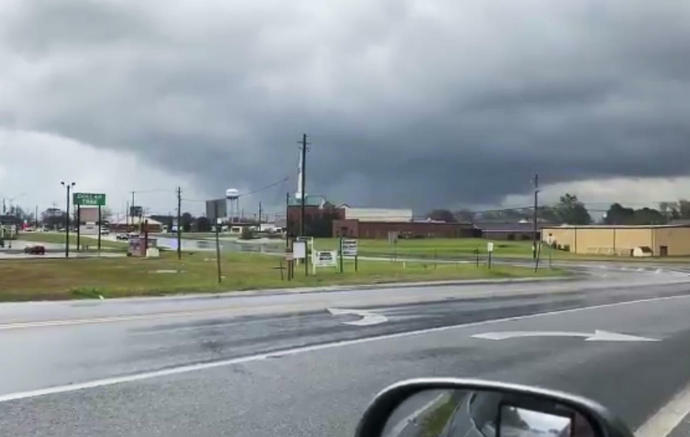 Dozens of emergency responders were called in to assist in Lee County, Alabama, after what appeared to be a large tornado struck Sunday afternoon as part of a powerful storm system raking the Southeast. At least two people two people died and many others were injured in the small community of Beauregard, said Rita Smith, spokeswoman for the Lee County Emergency Management Agency. Multiple homes were destroyed or damaged in Beauregard, about 60 miles (95 kilometers) east of Montgomery, Smith said. She had no further details in the immediate aftermath of the storm. Lee County Coroner Bill Harris told Al.com on Sunday evening that he expected the number of dead to rise in the hard-hit area as emergency responders combed through the wreckage and debris. He did not immediately return phone messages from The Associated Press. "We've still got people being pulled out of rubble," Harris said. "We're going to be here all night." Associated Press writers Kim Chandler in Montgomery, Alabama, Russ Bynum in Savannah, Georgia, Bill Cormier in Atlanta, and Ryan Kryska in New York contributed to this report.